CIRM (Luminy) workshop on geometric measure theory, with Magyar and Ziegler, Spring 2020. Tribute to Bourgain at the Combinatorics and Number Theory Conference at CUNY, May 2019. Northeast Analysis Network Excelsior Lectures, with L. Lanzani, September 2017 at Syracuse. Northeast Analysis Network Excelsior Lectures, with L. Lanzani, September 2016 at Rochester. CUNY Conference on Harmonic Analysis and Frame Theory, with A. Mayeli and G. Olafsson, June 2015. AMS Special Session in memory of Daryl Geller, with A. Mayeli, (2012). Conference proceedings volume was published. 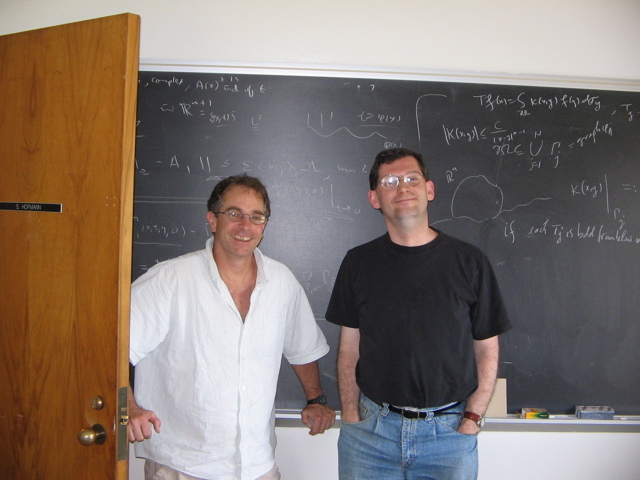 Fields Institute program on analysis, partial differential equations and combinatorics, with I. Laba, M. Lacey and E. Sawyer, 2008. Special Session on Harmonic Analysis (with Michael Lacey) at the regional AMS conference in Salt Lake City, Utah, October 3-5, 2006. NSF Focused Research Group Conference at the University of Missouri-Columbia, March 2006, with S. Hofmann, D. Mitrea and M. Mitrea. Combinatorial and additive number theory (CANT 2005). A conference in celebration of Mel Nathanson’s 60th birthday. (Member of the organizing committee). CMS conference at Simon Fraser University in Vancouver (with I. Laba), December 6-8, 2003. A conference on Harmonic Analysis and Partial Differential Equations at the University of Missouri, May 8-11, 2002, (with L. Grafakos, S. Hofmann, and I. Verbitsky). Workshop on convexity and Fourier analysis, (with L. Brandolini, L. Colzani, and G. Travaglini), Milan, Italy, June 2001.